Rickey Wallace, a 38-year member of the IAM, has served as General Vice President of the Southern Territory beginning October 1, 2018. He previously served as Resident General Vice President at Headquarters from 2016 to 2018. Wallace initiated into Local Lodge 1296 in Clarksville, Tennessee in April 1980. In 1991 he was elected to serve as President of his Local Lodge. In 1995 Wallace was elected as Business Representative of former District Lodge 155, now known as District Lodge 711, and held that position until 2008 when he was appointed Assistant Directing Business Representative. In April 2009, he was elected to serve as the President and Directing Business Representative for District Lodge 711 and held that position through November 2015. 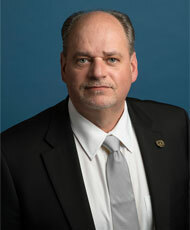 In 1996, Wallace was elected Area Vice President of the Tennessee State Council of Machinists and served in that capacity until being elected to serve as President in he was appointed to serve as President of the Southern States Conference of Machinists in 2009 and was elected to that post for two consecutive terms. Wallace has also served on the Workforce Development Board of Middle Tennessee, an agency created by Federal Law to assist in addressing the employment needs of businesses, career development needs of workers, workforce development and youth education throughout a seven-county region. In 2000, Wallace was appointed to serve on the Executive Board of the Tennessee Labor Management Center and was also elected as a Delegate to the 2000 Democratic National Convention, representing the 7th Congressional District of Tennessee. In 2013 Wallace was elected by the membership to serve as an IAM Delegate to the AFL-CIO National Convention. In 2015 he was appointed to Grand Lodge Staff serving as Special Representative and Grand Lodge Representative. In January 2016, he joined the IAM Executive Council in the position of Resident General Vice President. Wallace currently serves as a Union Trustee on the IAM National Pension Fund and the IAM National 401(k) Plan. In these capacities, Wallace takes an active role in representing the interests of the IAM.